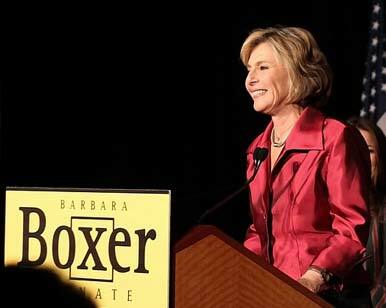 We have been working with Barbara Boxer since her first election in 1992. Pundits had labeled her first two victories flukes and she began her second re-election campaign in a pro-Republican environment. While Republicans put her near the top of their target lists, the Senator emerged victorious. Facing an anti-incumbent and anti-Washington wave, an opponent who was a former CEO and pledged to spend millions of her own fortune, and unlimited interest group spending, Senator Boxer’s third re-election effort in 2010 would be the most difficult campaign of her career. Senator Boxer, the campaign and The Mellman Group recognized the challenge early and mobilized accordingly. More than a year before the election, we conducted focus groups among swing voters across the state to explore evaluations of the Senator and develop a strategy to steel her against the battle to come. Voters knew Senator Boxer as a fierce advocate for progressive causes, but were mostly unaware of her many accomplishments for California and of her efforts to create jobs. Research revealed the importance of using concrete examples to illustrate her effectiveness (building a veterans hospital, starting after school programs that keep a million kids off the streets and out of gangs). In the toxic climate of 2010 that wouldn’t be enough, however. Voters also wanted to know what Senator Boxer would do to create jobs in the state suffering the nations’ second highest unemployment. Boxer’s agenda resonated strongly: clean energy jobs, small business tax credits and ending tax breaks for corporations shipping jobs overseas. Our analysis of the data and the situation revealed a further strategic imperative, beyond merely communicating Senator Boxer’s many achievements: we had to define our opponent, Carly Fiorina, before she had a chance to define herself. Immediately on the heels of the Republican primary, we conducted focus groups among swing voters to examine the best line of attack on Carly Fiorina, the results of which provided grist for a follow-up survey which began within hours after the groups were complete. Our central finding: while Senator Boxer had successfully run in the past on social issues such as choice, guns and the environment, Fiorina’s failed record as CEO of HP would be a more potent line of attack in 2010. Shipping jobs overseas was a mortal sin in this economy and one which Fiorina had committed. Indeed, she fired 30,000 people and sent thousands of jobs to China, while collecting over $100 million dollars in compensation for herself, demonstrating that she was out for herself, not for Californians. With the contours of our message strategy set and well researched, we turned to internet ad testing to ensure we were putting our best, most effective ads on the air. Our efforts were successful, as Fiorina failed to gain much traction in the vote after the Republican primary and her unfavorables climbed steadily throughout the campaign. Focus groups were conducted early and before every major round of research to provide a key means of testing our theories as well as uncovering new ideas. Survey research tested our focus group findings and translated them into actionable guidelines for earned and paid media. Our award winning on-line ad testing, using randomized experimental designs, enabled us to choose among the brilliant television ads produced by GMMB and tweak them to maximize their impact. With Carly Fiorina spending $5 million of her own money, raising another $13 million, and other outside Republican groups such as Crossroads and the Chamber of Commerce dropping another $11 million into the state, Senator Boxer prevailed by exactly the same 10-point margin our nightly tracking projected. The campaign received multiple honors, including being named California’s best campaign of 2010 by Cal-Peek, the pre-eminent political newsletter in the state.